David Ecker holding a flight suit worn by his father, Commander William Ecker, who flew missions over Cuba, Tuesday, Oct. 23, 2012, at the museum in Washington. The suit worn by Commander Ecker who flew a reconnaissance mission over Cuba in 1962 that photographed nuclear missile sites under construction by the onetime Soviet Union, was donated Tuesday to the Smithsonians National Air and Space Museum. AP Photo/Mark Avino, Smithsonian's Air and Space Museum. 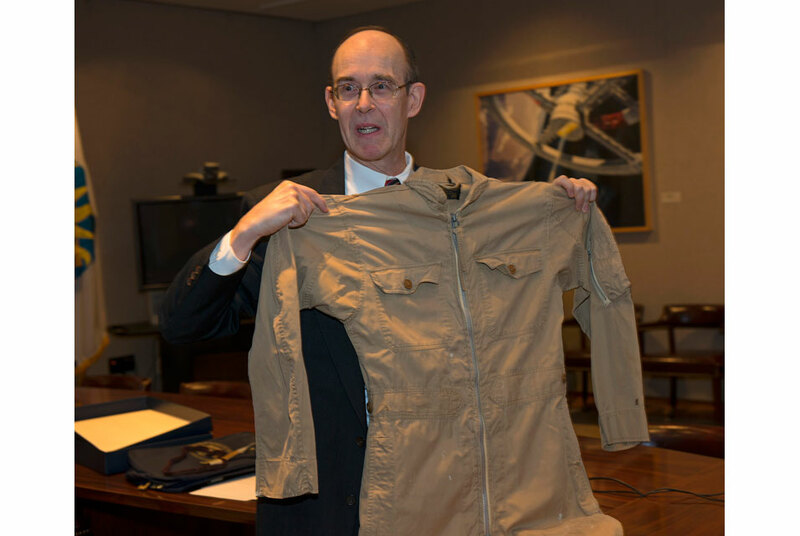 WASHINGTON (AP).- A flight suit worn by an American pilot who flew a reconnaissance mission over Cuba in 1962 that photographed nuclear missile sites under construction by the Soviet Union was donated Tuesday to the Smithsonian's National Air and Space Museum. The family of Navy Capt. William Ecker, who died in 2009, pulled the nondescript khaki flight suit from a family closet to make it a museum piece on the anniversary of his flight. Photographs taken on Ecker's low-level flight over Cuba on Oct. 23, 1962, were used two days later by the U.S. ambassador to the United Nations to help prove Soviet missiles were being stockpiled in Cuba. After nearly two weeks of extreme tension, the Cuban missile crisis was peacefully defused. The suit has no military patches or labels with Ecker's name because he was flying a secret mission. If his RF8 Crusader jet had been shot down, the Navy wanted to be discreet. So Ecker carried only a prisoner-of-war card in case he was captured, the pilot's son, David Ecker, said. While the museum has spy planes from the era in its collection, this is its first personal artifact from the missile crisis, said curator Alex Spencer. He hopes to display it eventually in the Naval aviation gallery. Ecker's flight was featured in the movie "13 Days," recounting the Cold War standoff 50 years ago involving then-President John F. Kennedy and the Soviet premier, Nikita Khrushchev. Ecker, who spent much of his life in the Washington area and was a volunteer at the museum, also wrote a memoir, "Blue Moon over Cuba," before his death. It was published in August. Gagosian Gallery opens new exhibition space at Le Bourget in the north of Paris with "Morgenthau Plan"